From the Mail Settings page you can enable, disable or edit the emails that are sent automatically for different actions. 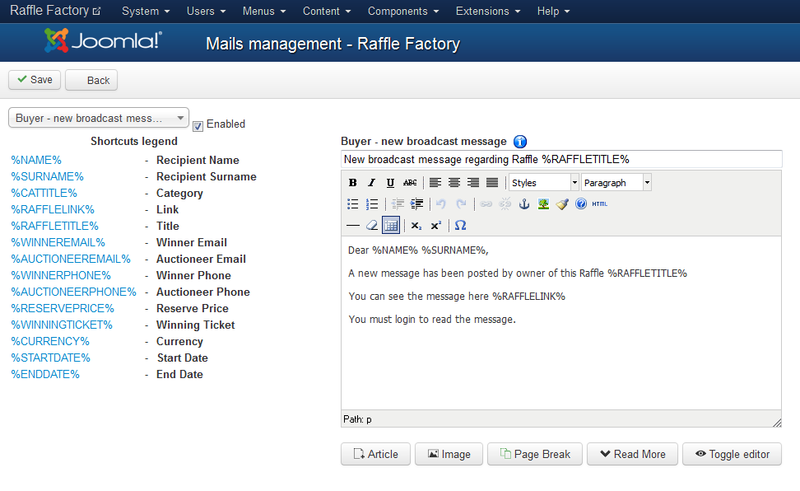 Buyer - new broadcast message: Sent to buyers when raffle owner posts a broadcast message. Buyer - new message: Sent to buyer when he receives a new reply from auctioneer. Owner raffle - raffle created successfully: Sent to the owner of the raffle when the raffle is created. Admin - raffle pending approval: Sent to the admin when a new raffle is posted and awaiting approval. Watchlist - raffle added to watched category: Sent to users when a new raffle is added in a watched category. Owner raffle - closed by admin: Sent to the owner of the raffle when an admin closes his raffle. Owner raffles - new admin message: Sent to the owners of the raffles when they receive messages from the administrator. Buyers - Raffle canceled: Sent to the ticket buyers when raffle is canceled. Owner raffle - choose winner: Sent to the owner of the raffle when the raffle closes and manual winner selection is chosen. Buyer - raffle closed: Sent to buyers on an raffle that got closed after. User - new rating received: Sent to users when they receive a new rating. Watchlist - raffle canceled: Sent to users when a watched raffle is canceled. Watchlist - raffle close: Sent to users when a watched raffle is closed. Watchlist - raffle will expire: Sent to users when a watched raffle will expire in 24 hours. Owner raffle - raffle about to expire : Sent to the owner of the raffle the day before the raffle will expire. Owner raffle - New tickets sold: Sent to the owner of the raffle to inform him about new tickets sold for his raffle. Buyer - tickets bought confirmation: Sent to the tickets buyer a confirmation for tickets bought. Owner raffle - commission paid for tickets sold : Sent to the owner of the raffle to inform him about commission retained from balance related to tickets sold. Buyer - has the winner ticket: Sent to the buyer that has the winner ticket. Owner raffle - have a winner for his raffle: Sent to the owner of the raffle to inform about the winner of his owned raffle. Buyers - which lost the raffle: Sent to the buyers that have tickets bought to raffle and lost when the choice was made for the winning ticket. Owner raffle - raffle closed without winner : Sent to the owner of the raffle to inform him about the new status of his raffle. Buyers - which received refund: Inform tickets buyers about increased balance with refund of amount paid for tickets bought at a raffle. Owner raffle - which pay refund: Inform sellers sellers about decreased balance with refund of amount earned for tickets sold at a raffle. Owner raffle - which received refund commission: Sent to the owner of the raffle when the balance is increased from the refund of amount paid for commission retained by site for tickets sold. Buyer - raffle closed without winner: Sent to buyers on an raffle that got closed and which didn't have a winner. Watchlist - raffle closed without winner: Sent to users when a watched raffle is closed without a winner. Note that you can enable or disable just some of the emails by clicking on them from the drop-down menu and checking or unchecking the tickbox, if you want them all to be activated be sure to verify them one by one! On the left side of the editor, you will find a list of shortcuts that you can use on the editor. The CRON has to be configured and running regularly in order for all the notifications to be sent. 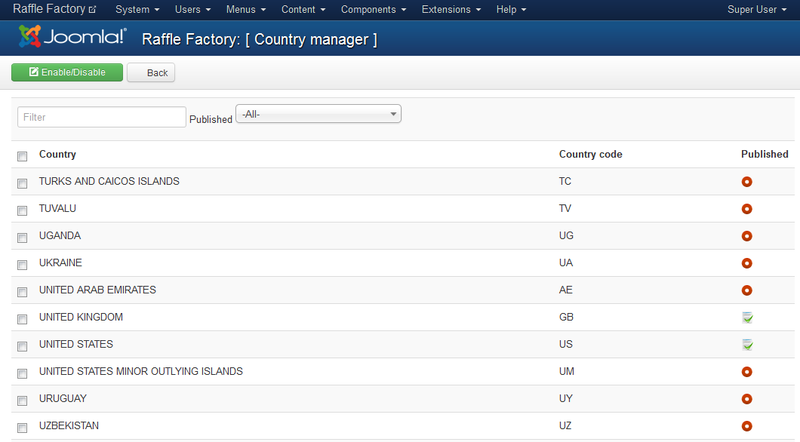 The Country Manager section allows you to set up which countries are published. Users will have only the enabled countries to choose from when setting their profiles. From the Import/Export section you can create an ".xls" file containing a list with all the raffles available on your website or to import an ".csv" file adding additional raffles. With Import CSV you can import data as a bulk upload, which will append the data to your existing database. This will help for example populating much more easily your database, uniting in one the existing records which are kept in different formats. To import a CSV file, click on the Browse button, select the file from your HDD and click on the Save button found at the top of the page. In case you have a .zip file containing images of these raffles, you can also upload it the same way, using the provided field. It is important to know that this feature requires strict conventions in the files to work properly, each value is inserted in the database and order must be respected. Custom fields are not supported. Use the exports as reference before using the Bulk import feature. Export XLS will save an Excel spreadsheet with all the raffles on your website in your desired location.